I hope you all had a nice weekend. We had a very fun weekend with hubby's birthday celebration. It was so nice to have his birthday fall on a Saturday this year, and whenever we have a birthday occur on a Saturday, we continued the celebration till Sunday! As with any other celebration, lots of food was involved and shared with family and close friends. Anytime, or all the time, between Thanksgiving and Christmas is a good time to be decorating a tree. We do it as something of an ongoing project, adding a few more when the inspiration occurs. Here is a quick and simple ornaments themed lunch which was created with a circle cookie cutter. In this bento lunch (packed in a Lunchbots quad): A couple of circle shaped sandwiches with Colby Jack cheese accents and a pick. 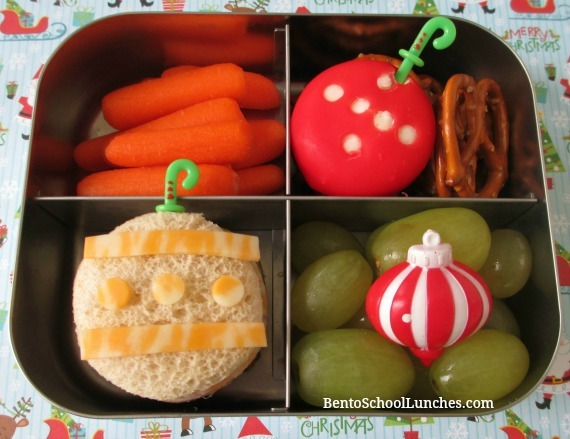 Seedless grapes with an ornament cupcake ring, organic baby carrots, Babybel cheese decorated with some tiny circles topped with an ornament hook pick and sharing its quadrant with pretzels. Loving that ornament sandwich! So cute! Thank you Melissa, so glad to know that you like it!